Latest addition: acrylic box frames. Because, I mean, whoa, those are some ugly frames. These suckers haven’t been in fashion since the 80’s and every Goodwill on the planet will have at least couple of them at all times, right? I know you saw them. Don’t deny it. 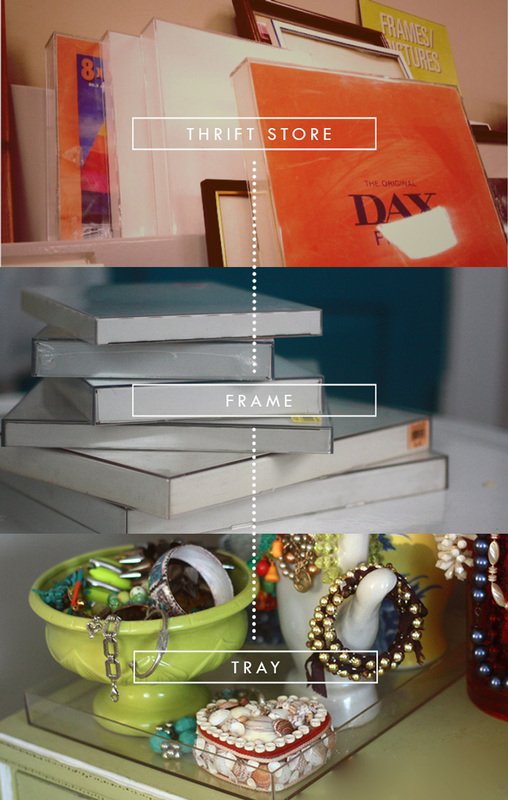 The big ones can be a few bucks, but the standard photo frame sizes are usually around 99cents. I bought eight. For good measure. Naturally. Now let’s play a game: Can you spot the 80’s acrylic box frame? You found it! On the wall it’s an acrylic frame. On the desk it’s a lucite tray. Apparently lucite is the fancy pants brand term for acrylic. Like how we ask for a Kleenex when all we want is a tissue. Did anyone ever deny themselves a good sneeze because the tissue wasn’t name brand? Didn’t think so. 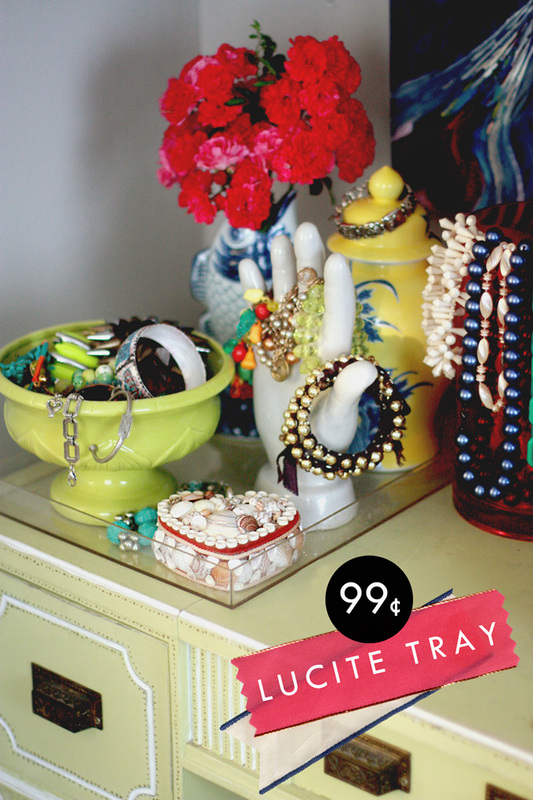 Lucite trays are one of those all-purpose weapons interior decorators use to harness mixed items and make them look a little neater without adding visual weight. I like them because they keep my junk in line. I do not, however, like the price tag. (This one runs around $40). Let’s make are own, shall we? Just take the innards out and flip it upside down. Boom. It’s a tray. They scratch pretty easy so I will probably put some of those clear silicone foot thingies on eventually, but for now, this is great. And so what if it does scratch? Big whoop, it was 99cents and Goodwill has a bunch more waiting to happen. I kindof hate myself for not thinking of this before. You’re a genius! Yeah. Part of me hates myself too. I actually bought one of those trays a while back. Whoops! I see what you did there…LOL. Great idea! and even if they scratch you can mod podge them and make something new! lol, one of those duh! moments! guess what i’m doing this weekend?? You, my dear are sooo clever !!!! Ya heard. And you too, Marissa! I didn’t know those frames were out of style. I still have a lot of them filled with kids’ artwork. You have the same shell box I have, or did I send it to you? Did I miss the pompom post? They are also a great way to store rubber stamps that are mounted to wood blocks. Cute and functional. Yo HEART Genuine Lucite! Lucite is my favorite for fun jewelery, boxes, and fabulous containers. All of the fun and bright colors! You are hilarious! Love your style. i’ve been coveting this jonathan adler tray (http://www.lifeguardpress.com/product/jonathan-adler-large-tray?display=821) but won’t spend 90 bucks. i might modpodge some pretty wrapping paper in the bottom for the same effect. Well, aren’t you the clever one! Thanks for brining the obvious to our attention. Love this idea. Wish I hadn’t tossed away the acrylic frames. This is such a fantastic idea! Now I will be on the lookout for one of those next time I’m at the thrift store! Wonderful repurposing! Kudos to you! Brilliant! Great way of thinking…within the box? Inspiration for my next trip to the goodwill. Goodwill, heck! I’ve got some of those in my basement. 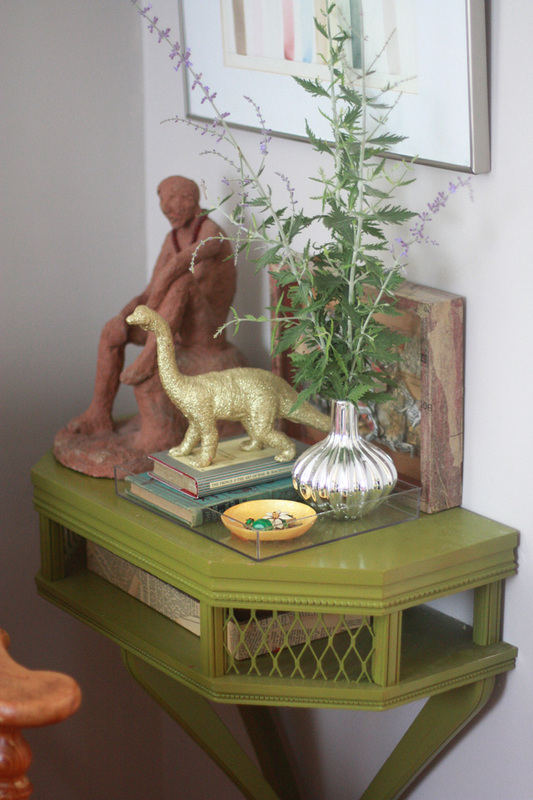 Love Lucite, and love Goodwill! Heck this is a no brainer! Thanks for the simple tip!!! Totally going to use this for my jewelry shows!